Alright, I’ve got some good news and some bad news for you. Okay, bad news first: If you want to become fluent in Spanish you’ve got to do more than just learn grammar and vocabulary. Practicing speaking what you’ve learned from textbooks doesn’t quite cut it either. Sure, all of these elements are necessary to build a solid foundation, but learning another language entails a whole lot more than just translating individual words and grammatical structures from English. I know—it’s natural to want to literally translate from your native language. I mean, that’s all you have to work with, right? Wrong. Here’s the good news: I’ve been living in Madrid, Spain for the past two years and have learned a thing or two (or twenty-five) about Spanish phrases. For every literal English to Spanish translation, there’s almost always a colloquial phrase in Spanish that’s used way more often. Using literal translations (even technically correct ones) is a dead giveaway that you’re a foreigner who hasn’t quite reached fluency. Conversely, trading those literal phrases for more colloquial ones will immediately connect you to native speakers. After all, language doesn’t exist inside a bubble! The culture of a country is so interwoven with its language that you can’t help but integrate into that culture once you start speaking like a native. There’s a reason why the Fluent Spanish Academy, a learning program just for intermediate students who want to reach fluency fast, focuses on getting you accustomed to hearing authentic, real-world Spanish. Its creator—the popular polyglot Olly Richards—knows his stuff. 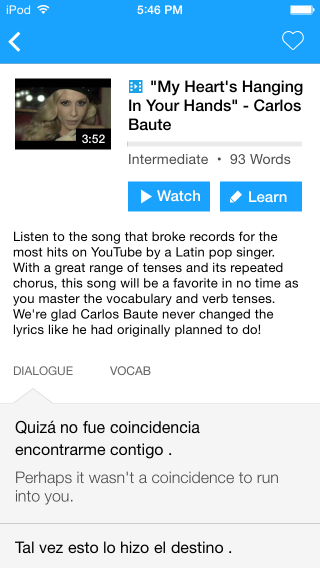 And hey, it’s something you may want to check out for further guidance after you’ve started learning the following Spanish phrases. For now, just focus on mastering these handy phrases and you’ll already be one step ahead. You already have the vocabulary and grammar you need to express your ideas, but here you’ll find the colloquial phrases to express them more fluently. Most of these widely-used Spanish phrases are impossible to work out through translation alone. 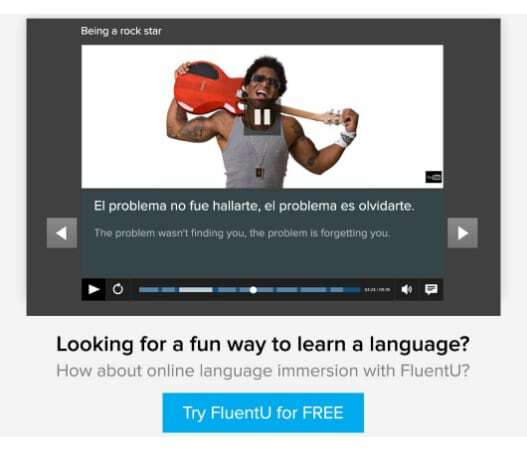 So here they are: 25 intermediate Spanish phrases to immediately boost your fluency. 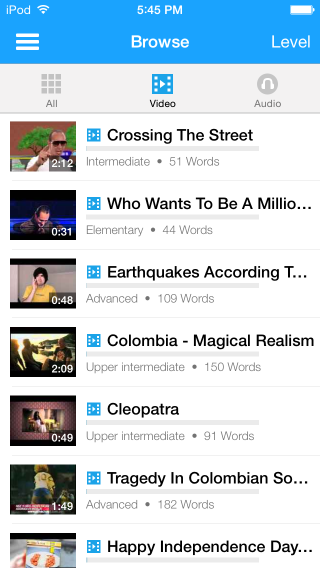 And you can pick up even more authentic words and phrases with FluentU. How? 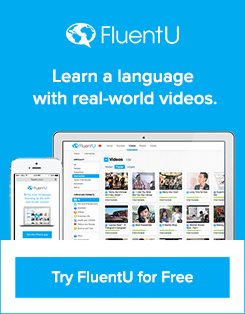 Well, FluentU takes real-world videos, like music videos, commercials, news and inspiring talks, and turns them into Spanish learning experiences! Literal translation: No te preocupes, no es necesario hacer nada. Colloquial phrase: No te preocupes, no hace falta hacer nada. Literal translation (correct but not colloquial): No es importante/No importa. Colloquial phrase: Qué más da. A similar colloquial expression the Spanish use to express this sentiment is no es para tanto (it’s not a big deal). Literal translation (correct but not colloquial): Me siento muy cómodo aquí. Colloquial phrase: Me siento muy a gusto aquí. Literal translation (correct but not colloquial): Hemos terminado el jamón. You can polish off any kind of food with this phrase, for example, nos hemos ventilado las galletas (we’ve finished off all of the cookies). When you use ventilarse with beverages it means to “down” or to “chug,” e.g., se ha ventilado la cerveza de un trago (he downed the beer in one gulp). Literal translation (correct but not colloquial): No puedo cocinar bien la tortilla española. Colloquial phrase: La tortilla española no me sale. This phrase structuring is similar to “just doesn’t work out for me.” No me sale is such a simple phrase and it can be paired with so much! For example, no me sale el pino (I can’t do a handstand/My handstands don’t turn out right). Literal translation (correct but not colloquial): ¡Estoy muy emocionado! Colloquial phrase: ¡Estoy muy ilusionado!/¡Tengo mucha ilusión! Literal translation (just plain incorrect): ¡Tengo que hacer pis mucho! The above phrase would actually mean “I usually have to pee a lot” in a general sense, and if this is you then you’re what the Spanish call un meón/una meona. By the way, hacer pis in Castilian Spanish isn’t considered vulgar at all, although in the context of Latin American Spanish I would be cautious about saying it. Colloquial phrase: ¡Me estoy meando! The colloquial phrase literally means “I’m peeing myself,” so you’ll notice we’ve got another reflexive verb here with mearse. The first time I heard a Spaniard say this I couldn’t believe my ears. You’re peeing yourself?! Like, at this very moment?! It’s quite an emphatic (if not melodramatic) way to get the point across, but so incredibly common here. Literal translation (just plain incorrect): Me siento terrible. Colloquial phrase: Me siento fatal/Me encuentro mal. Me encuentro mal is more formal than me siento fatal, and literally translates to “I find myself unwell.” Rather formal indeed! 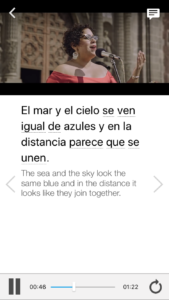 Literal translation (just plain incorrect): ¿Podría tomar una mirada? Tomar una mirada does not exist in Spanish. Colloquial phrase: ¿Puedo echar un vistazo? Literal translation (just plain incorrect): No puedo pensar de nada. Colloquial phrase: No se me ocurre nada. Another thing you might say to express this same idea is “tengo la mente en blanco,” (I’m drawing a blanks). Literal translation (correct but not colloquial): Perdona pero no he entendido nada de lo que me acabas de decir. Literal translation (correct but not colloquial): He estado en España dos semanas. Literal translation (correct but not colloquial): La reunión fue muy aburrida. Colloquial phrase: La reunión fue un rollo. Literal translation (correct but not colloquial): No me presta atención. Colloquial phrase: No me hace caso. Literal translation (correct but not colloquial): Estoy muy cansado. Colloquial phrase: Estoy hecho polvo. Literal translation (correct but not colloquial): ¡Se ve bien la tarta! Colloquial phrase: ¡La tarta tiene muy buena pinta! Literal translation (correct but not colloquial): ¡No, no te creo! Colloquial phrase: ¡Qué va! ¡Venga, hombre! 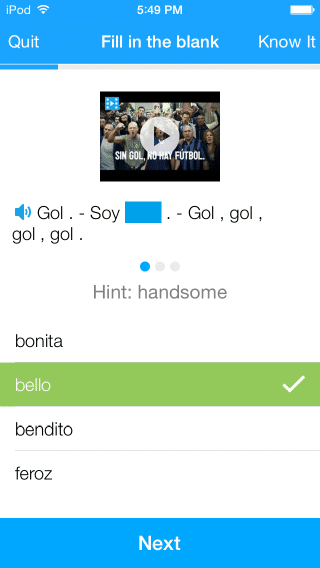 “Venga, hombre” is usually placed at the end of a sentence and can also mean “you have to be kidding.” ¡Qué bobada! ¡Qué disparate! and ¡Qué tontería! are very similar phrases that can be used instead. Literal translation (correct but not colloquial): Estoy enfermo. Literal translation (correct but not colloquial): Claro que sí, eso es obvio. Colloquial phrase: Claro, hombre, eso es de cajón. Literal translation (correct but not colloquial): Sí, no pensé en eso. Literal translation (just plain incorrect): Eso no tiene nada que hacer con lo que estoy diciendo. This sentence is a direct translation that doesn’t make any sense. Colloquial phrase: Eso no tiene nada que ver con lo que estoy diciendo. Colloquial phrase: Has dado en el blanco/Has dado en el clavo/Has dado en el quid de la cuestión. Literal translation (correct but not colloquial): Creo que estás confundido. Colloquial phrase: Me parece que te has hecho un lío. Literal translation (just plain incorrect): Estás absolutamente correcto. Colloquial phrase: Tienes toda la razón del mundo. We’ve covered quite a bit of colloquial phrases and now it’s time to let it all sink in. It takes a while to really learn untranslatable phrases since our first instinct is to literally translate everything we want to say directly from English. After some practice, however, these phrases will be effortlessly sliding off your tongue in no time and you’ll find that native speakers are really impressed by this sort of attention to the nuances of their language. Who knows—maybe you’ll even be confused for one of them someday! Constance Chase is a writer and English teacher living in Madrid, Spain with her Spanish husband, Javier. When she is not making hopeless attempts to explain terms like “hipster” and “swag” to her students, she can be found reading on the Metro or wolfing down Spanish ham and two euro wine in old man bars.